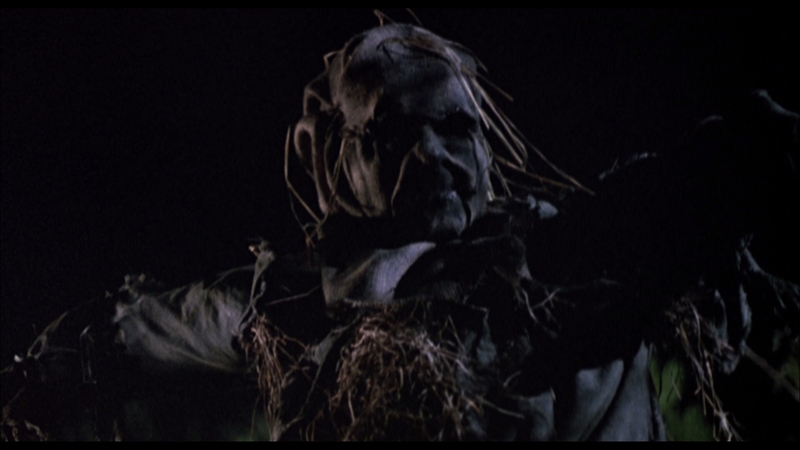 Scarecrows is a wildly underrated horror film from the ’80s. 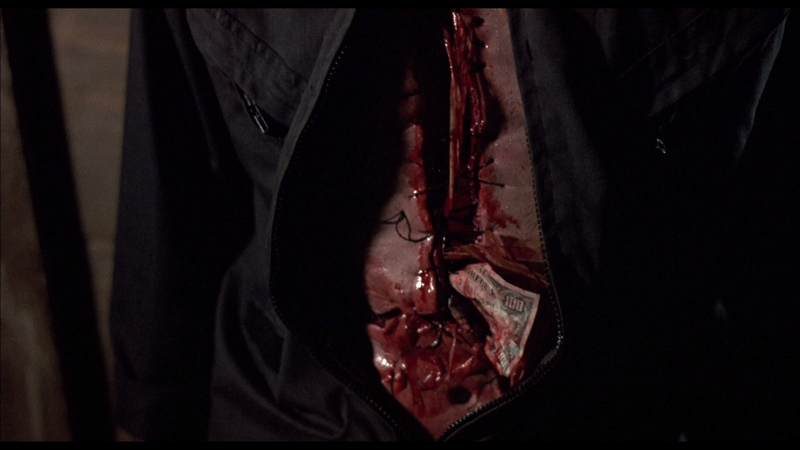 Director William Wesley’s 1988 supernatural thriller is creepy and packed with action, a rare hybrid that easily plays in both genres without missing a grisly beat. 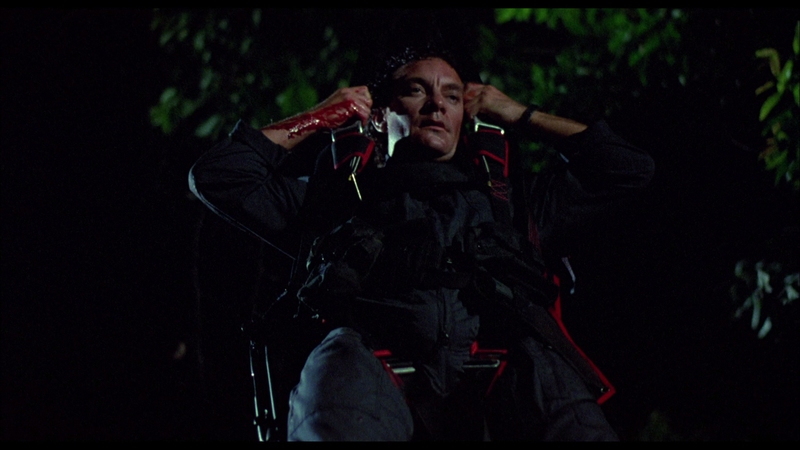 More importantly, Scarecrows is bloody good fun that genre fans will lap up. While the script doesn’t reinvent the horror genre, the titular scarecrows make for memorable horror villains. Scarecrows takes place over the course of one very dark night, mostly in an abandoned graveyard. Five former commandos pull off a multi-million dollar heist, taking a pilot and his daughter hostage as they commandeer a plane headed for Mexico. Things fall apart for the ex-military thieves when one of their own double-crosses them, parachuting out of the plane with the stolen money. Bert’s parachute lands near an abandoned house with the money, hoping to make a clean getaway. The house is oddly fronted by three of the creepiest scarecrows you’ll ever see in its front-yard. It is immediately apparent something truly evil has gone down at this property, like the Manson family use it as their vacation home or something. The team of commandos naturally go after Bert and the money. Carrying enough artillery for a small army as Bert is on his own, the soldiers think he will be easy prey once they land the plane. They are so, so wrong. What Bert and the soldiers don’t know is that this abandoned house is lorded over by three supernatural scarecrows which are shockingly intelligent for boogeymen in a horror movie. 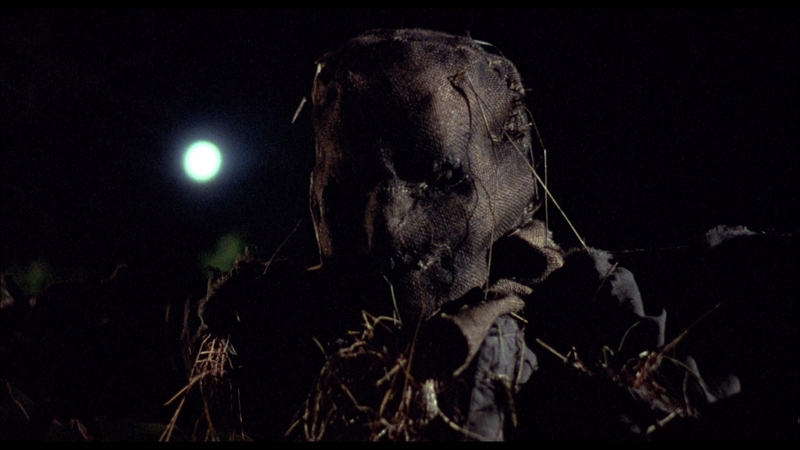 While the scarecrows have the same taste for human blood and dismemberment as most movie monsters, they aren’t the mindless killing machines of a Jason or Michael Myers. It’s interesting to see their conflict with the over-matched soldiers and how the scarecrows surprise them at every turn. The action-horror hybrid works so well because many fans have wished to see fully-armed soldiers take on the supernatural. You would think their guns and training should give them a huge leg up on the average Joe when facing down supernatural scarecrows with a penchant for killing. 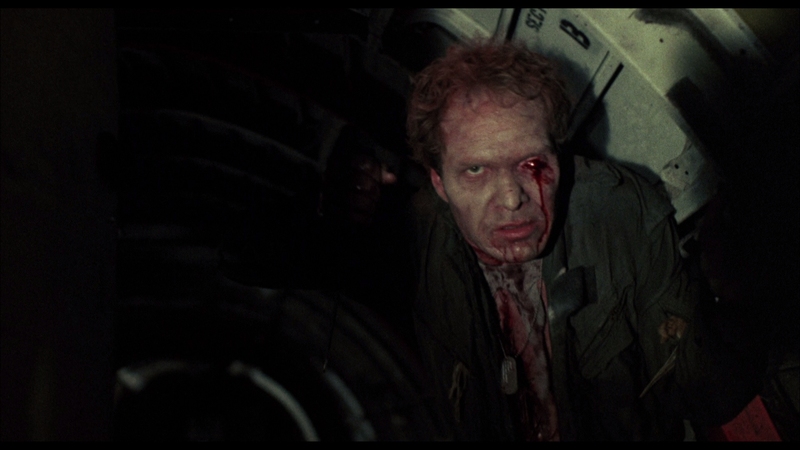 Characters in horror movies are almost always powerless to directly confront the evil monster and take them out. They usually need help of some kind from an outside force. Scarecrows gives these trained soldiers a full gauntlet of weapons to battle the menacing creatures, lulling the audience into a false sense of security. The soldiers are as helpless as the random teenagers that get killed in most slashers. 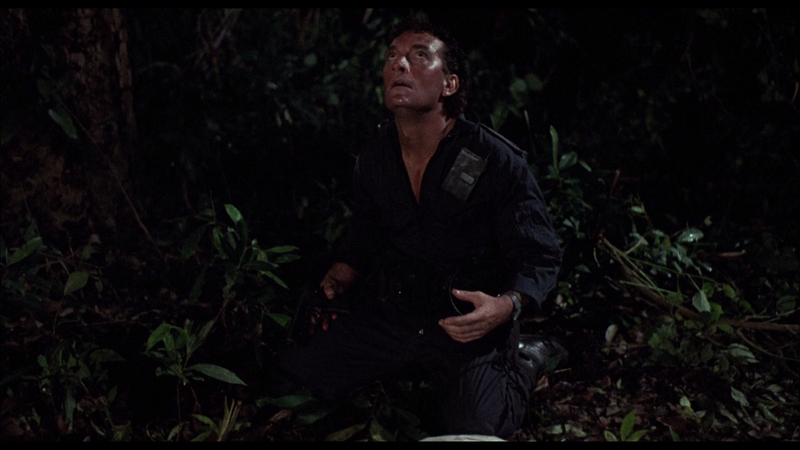 This film was dying for one of the commandos to be played by a major icon like Arnold or Stallone. Scarecrows may have become a huge horror classic with a more charismatic cast. Everything else hits on all cylinders. 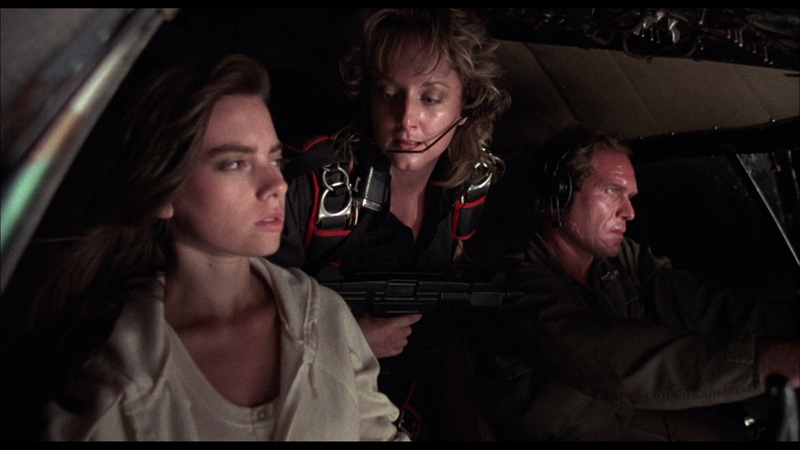 The pilot’s daughter is the one truly innocent character in the entire film and plays a central role. Victoria Christian mostly sleepwalks through the role as a forgettable ingenue. 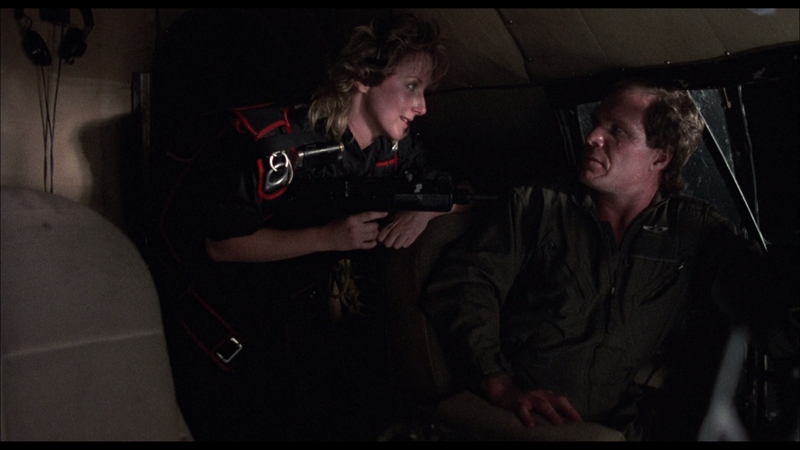 This film was dying for one of the commandos to be played by a major icon like Arnold or Stallone. 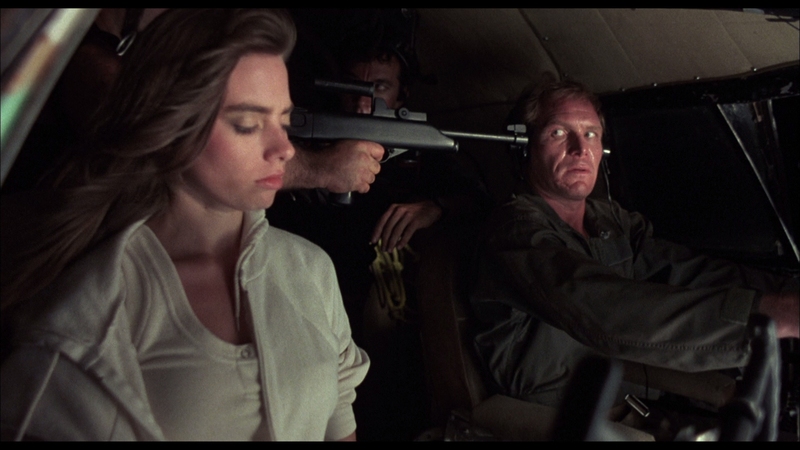 They would have invested far more personality and charisma into the commandos as characters. The soldiers end up being hammy more than anything else, though I guess some might find that a part of the film’s charm. Scarecrows is a scary film that drips with atmosphere for jaded horror viewers. Its story has a hint of plausibility from the real world that creates a grounded sense of unease. By the end, many will likely be rooting for the scarecrows to finish the job since the criminals aren’t good people to begin with and deserve their grisly fates. This is a minor lost gem from the 1980s that shouldn’t be forgotten and will likely gain new fans with this outstanding home edition. 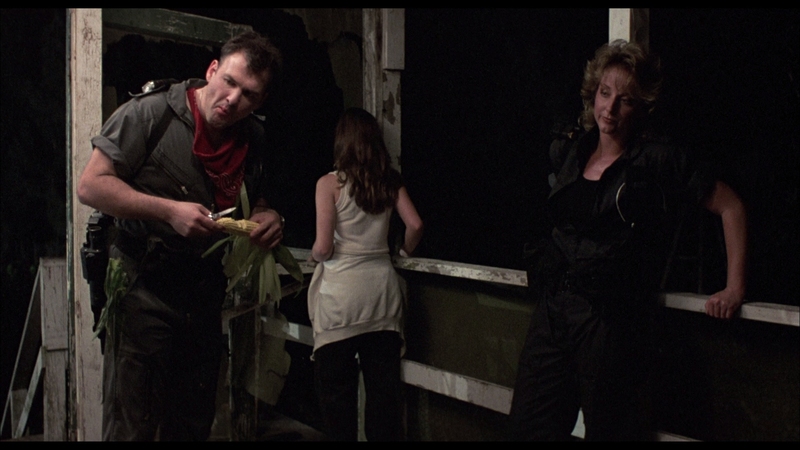 Scream Factory issues Scarecrows in a satisfactory Hi-Def presentation for this Blu-ray. 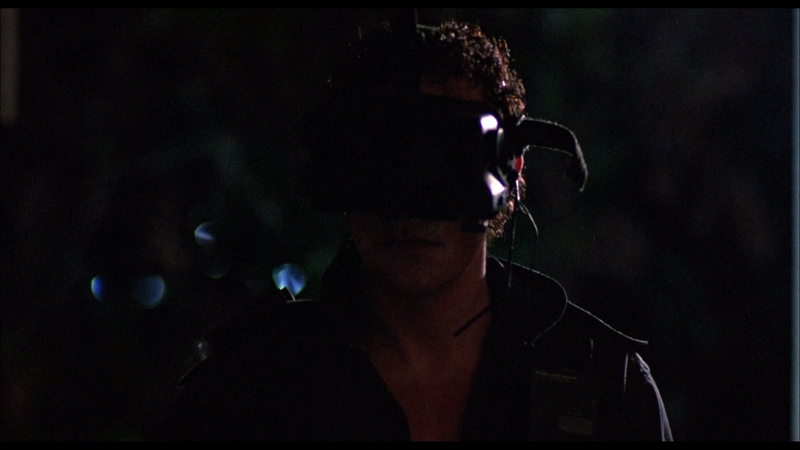 The 1988 film has been licensed from MGM, which has led to inconsistent video results in the past. This is not so with Scarecrows, it has a fine film transfer from elements in solid condition with few blemishes. The unrated, uncut 83-minute main feature is presented in its original 1.85:1 aspect ratio at 1080P resolution. That is encoded in AVC on a BD-50, averaging a fantastic 35 Mbps for the transparent video encode. 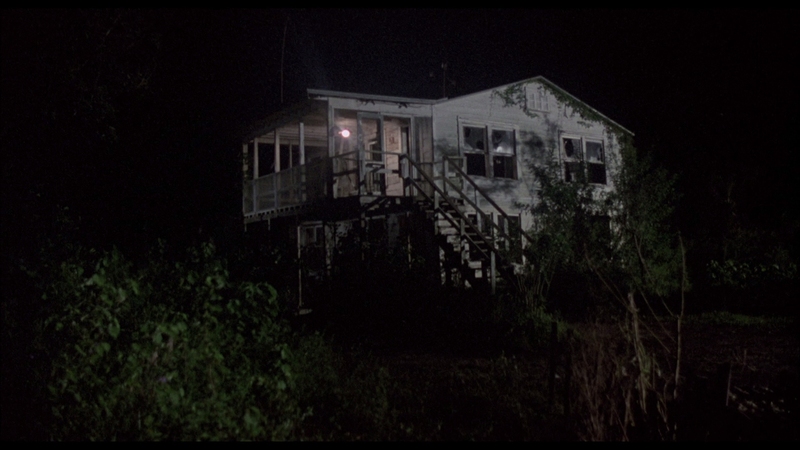 The atmospheric film takes place almost entirely at night, so lighting conditions are not always perfect for every shot. 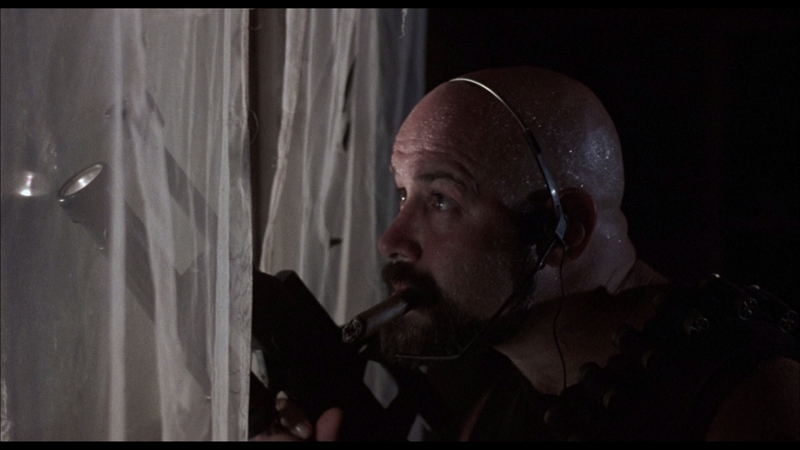 Peter Deming’s cinematography has decent depth for a low-budget horror production from the Eighties. Black levels slightly crush shadow delineation, though hold up surprisingly well most of the time. 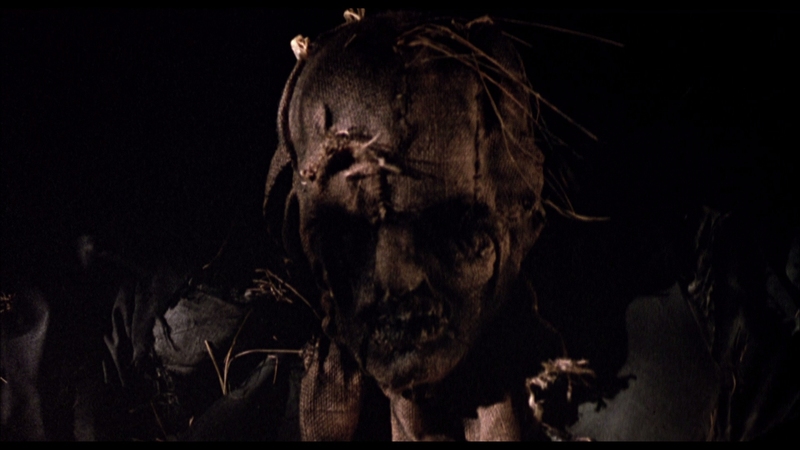 The softest scenes include the scarecrows themselves, including some older special effect shots that look a couple of generations away from the negative. Scarecrows provides fairly solid fine detail. The film transfer may not be a new scan from pristine elements; it is more likely this master was struck by MGM as a telecine or done at 2K resolution a couple of years ago. It doesn’t really matter. The printing elements must be close to the negative. A few specks of dirt don’t intrude. Fans should be pleased by this unprocessed film transfer. It is film-like in appearance without significant processing, leaving in as much 35mm film detail as possible in the 1080P video. The grain structure is unobtrusive, slightly exacerbated by the higher-generation print from which the master is struck. Scarecrows is not demo material but you can’t ask for much more from it than this good-looking catalog transfer. 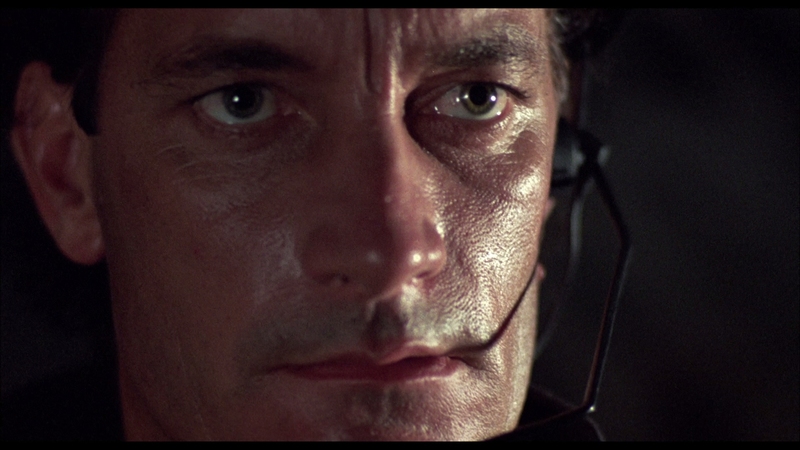 Hints of artificial noise hide in the film’s grainier shots. The 5.1 DTS-HD MA audio has expansive surround cues and packs solid bass. A much smaller-in-scope 2.0 DTS-HD MA presentation has less of an impact. The surround mix is the way to go, even for die-hard purists. The 5.1 mix simply has a bigger, better sound with effective ambiance. It appears to have been completely remixed from the original stems for bone-crunching sound in crisp quality. This is definitely some of the finer vintage sound I’ve heard from a forgotten horror movie, the recording has extended dynamic range and clean fidelity. Optional English subtitles display in a white font. Scarecrows was originally meant to be a double feature for Scream Factory, until fans demanded a special edition loaded with bonus features. The horror imprint of Shout Factory has long been known for creating new special features for a wide array of genre films on Blu-ray. Scarecrows gets two audio commentaries and finds key cast and crew giving new interviews on their experiences. It’s a sweet package that adds up to an essential purchase. Audio Commentary With Director William Wesley and Producer Cami Winikoff – This is a flowing, loose back-and-forth with a third person as moderator to keep things going. They share a number of amusing stories about making Scarecrows and their memories of the cast. Wesley had been making documentaries before Scarecrows and recounts his participation in shaping its final product. I found this highly enjoyable and an easy listen. Audio Commentary With Co-Screenwriter Richard Jefferies, DP Peter Deming, and Composer Terry Plumeri – This is a faux commentary, as it really combines three separate audio interviews with each man talking about their area of expertise. They don’t directly address the action on screen. Jefferies is a blast, revealing some fun anecdotes and also talking about another project he worked on, The Vagrant. Despite this not being an actual commentary, the interviews are informative and help reveal how Scarecrows was made. Stills Gallery – Dozens of still photographs from the set and publicity. Original Storyboards (03:48 in HD) The storyboards play in sequence without needing the user’s input. The Last Straw (16:35 in HD) – An Interview with special make-up effects creator Norman Cabrera. He goes over his background and the kind of creativity needed for this job. It’s a highly effective featurette for FX hounds. Cornfield Commando (08:46 in HD) – Actor Ted Vernon fondly recalls working on the movie and his beloved dog that also appeared in the movie in this new interview. Vernon is very proud to have worked on Scarecrows and wishes it had received a theatrical release at the time. Full disclosure: This Blu-ray was provided to us for review by the studio. This has not affected the editorial process. For more information on how we handle review material, please visit our about us page to learn more.